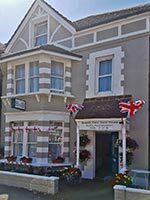 Situated in a quiet residential street in the heart of Bexhill on sea, the Buenos Aires Guesthouse is the perfect place to visit the 1066 countryside with plenty of local attractions and things to do.We also offer the business guest a perfect location with the early breakfast to help your start your day. We offer five bedrooms which three en- suites, on the first and second floor so wheelchair access is not available. For breakfast we offer a buffet of cereals, yoghurts and fruits and then serve a full English breakfast, continental, smoked salmon or treat yourself to something of your choice pre ordered the night before. We look forward to welcoming you. If you have any queries or require any assistance please phone 01424 212269 /07944 891594 or email buenosairesguesthouse@hotmail.com. • Our guest house is located on Albany road, a side street from the Marina at the seafront. There is ample free parking on the public road in front of our house. The road is level and flat and a footpath runs in front of the house.The bus stop is just around the corner in front of the De La Warr Pavilion, less than one minute walk from our property on a flat surface. • Bexhill train station is a 7 minute walk. The first part of the walk is sloping down slightly to the seafront. The rest of the walk is level and flat. • There is a local taxi service available with wheelchair access. • Pick up from the train station by us can be arranged on prior arrangement. • The seafront is one minute walk and can be accessed by wheelchair. The promenade is flat and wide and is 2 miles long. • The town centre is also a one minute walk on a level foot path. • Help with your luggage is always available. • Parking is free but restricted to two hours from Mon-Sat 8 am – 6 pm. Unrestricted free parking is available nearby, at the seafront, two minutes walk from the property. • The main entrance is accessed along a short flat path to the main door. The entrance door has a small doorstep (approx. 2 inches high). • The reception area has a seat available. There is a bell in the reception area when assistance is required. This is available 24 hours a day, but please after 11 pm in case of emergencies only. We are available to be contacted 24 hours a day on 01424 212269/07944 891594.There is no cloakroom available on the ground floor. The flooring is a short pile carpet The area is even and well lit with overhead lighting Guest are shown to their bedroom and the breakfast room and the shared facilities if in room one or three. • We have 5 bedrooms in total. 3 On the first floor and 2 on the second floor. • All our bedrooms are spacious. • Beds can be accessed from both sides. • Bedside table and lamps with all beds. • All rooms have short pile carpeted. • All our bedrooms have lined curtains. • All our bedrooms have a seating area. • Three rooms have en-suite bathrooms two with step ups to the showers and one with a bath and overhead shower attachment. • The shared bathroom has a shower cubicle and small bath. • There is a separate W.C for rooms one and three but suituated on the first floor. • All flooring is laminated or tiled. • There is a small toilet on the first floor which does not have any hand rails or sink available. • We have a set of evacuation procedures – should you require it someone will come to your room and assist you with evacuation. 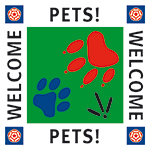 • We welcome trained assistance dogs. A water bowl is available just outside the front door for assistance dogs and can be supplied for bedrooms where necessary. • The nearest General Hospital is in Hastings with an A&E unit and walk in NHS is 5 miles away at the NHS Station Plaza and the nearest Doctor’s surgery is 1 road away. Please let us know if you require further information about these. • We can offer a list of nearby attractions and suggested places to eat with details of their Access Statements for information, where available. • We are able to use the front and back doors in the need of evacuation; the fire alarm rings continuously if evacuation is needed. If you require more assistance for evacuating please notify us on arrival and we will ensure you are evacuated safely e.g. hearing impairment. • We are a no smoking building. We can supply a small drinks fridge for in the bedroom which can be used for medication. • Our Guest House was built in Victorian times and has that lovely feel to it. However, due to the age of the property the layout might make access difficult for people with limited mobility. We aim to cater for the needs of all visitors in our home based 5 bedroom guest house. Although we have tried to be as accurate and include as much detail as we can in our Access Statement, we are always more then happy to give information on any aspect of the guest house if this statement does not answer your particular query.